This item has been sold and is no longer available. Please search our site for another selection and if you need assistance give us a call at 1-800-567-6922. 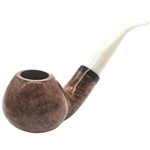 Dublin Mahogany Briar Pipe – Full Bent - Made in St. Claude, France. It is a beautiful piece that you will enjoy for years to come. 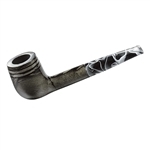 The stem is made of Vulcanite for good looks and long lasting durability. 100% satisfaction guaranteed. The briar pipes are boxed with a soft black drawstring pouch.